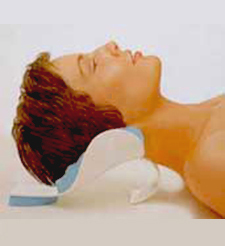 Real Ease Neck Support and Shoulder Relaxer: Invented by Doctor Writer (aka: Riter), this scientifically contoured neck treatment device lets you deeply relax. 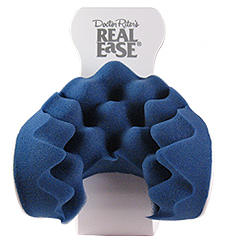 Doctor Riter's Real-Ease is the most advanced cervical neck support and relaxer in the world. It is unique and patented. Offers a simple inexpensive way to remove a tension headache or deeply relax your tired, sore neck and shoulders. This NEW DELUXE model has a more stable wider support base and more springy comfort. Why do so many people suffer from neck, head and shoulder discomfort? The musculature of the neck and shoulders is responsible for holding our head erect. In addition, essential sensory mechanisms of our life, i.e. eyes, ears, nose are all located in the head. When our necks are tight or jaws clenched, we set up a pattern of chronic spasms and tightness in all the muscles of the neck and shoulders. The dimensions of stress on these muscles are extraordinary. In addition, adequate blood flow into the head requires a relaxed musculature. Therefore, our need to provide deep relaxation for the neck is of utmost importance. If there was a simple, inexpensive, drug-free, non-toxic way to deeply relax your sore and tired neck, would you give it a try? Imagine having a skilled massage therapist gently and firmly holding your head, while you completely surrender the weight of your head into their healing hands. This is similar to what the Real-ease can accomplish. It facilitates focused traction of the sub-occipital muscles at the base of the skull, the origin of many tension headaches. The scientifically and orthopedically designed device gently cradles your neck along the base of the skull. The structure of the device allows you to deeply relax the weight of your head into the firm, soft inner surface while gently positioning your head so gravity can create a beneficial cervical or neck traction. This allows the many tight muscles of the neck and shoulders to relax. Wherever you can lean back or lie down, Real EaSe will make it more relaxing. Sissel Orthopedic Neck Pillow - Contoured Support Wave - Sissel's original swedish design set the standard for highly supportive, contoured cervical neck pillows; now hypoallergenic and heat dissipating.